The Story: Somewhere and sometime in the late 19th century, chemists Alex Olson and Damian Ridge are work partners. Damian is jealous of Alex for having married Linda, so he engineers a laboratory explosion in which Alex is seriously wounded. Damian buries Alex alive in the swamp and marries Linda. Over time, Linda grows suspicious, so Damian plots her death too. But just before he plunges a syringe into her neck, a Swamp Thing bursts through the window and throttles him to death. It’s none other than Alex, resurrected as a sort of plant-zombie. Realizing that he terrifies Linda, he shambles off into the fens, wondering whatever happened to the bracelet she once gave him. My Two Cents: The lineage of swamp monsters is long, a branching lineage that traces through other sentient shamblers from Frankenstein’s Monster through the Golem of Chelm back to mythical Greek automata. 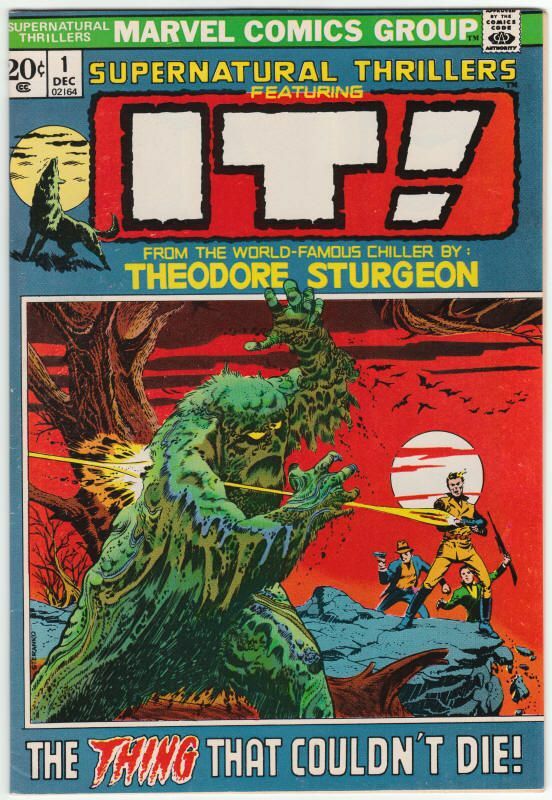 Theodore Sturgeon’s “It” (published in the magazine Unknown in 1940) fired many imaginations, and Solomon Grundy (1944) of course brought the concept into comic books. Stan Lee, Gerry Conway, and Roy Thomas claimed co-writer credit on the debut of Marvel’s Man-Thing just two months before Swamp Thing, but Len Wein disavowed any knowledge of that story making its way through the production cycle at the same time he was writing his. This was the highest selling DC Comic the month of its release. Did purchasers even know what was in it? I bet they plunked down their twenty cents just for the pleasure of owning Berni Wrightson’s gorgeous cover, which has become one of the most iconic images in comic book history. What media is this? Chalk? How was the stippling on her cheek achieved? The contrast between the two light sources – the warm yellow from the unseen lamp to the left of her body, versus the silver light of the full moon—effectively splits the cover into two worlds, one of comfortable domesticity and one of the terrors of the wilds at night. Rembrandt would approve. Many horror covers have an element of sexual danger, and this picture of a beautiful woman caught by surprise in her nightgown and her bedroom is no exception. Len Wein’s taut, economical story has that element too but flips the hero and villain roles from the husband to the monster in this Poe-like tale of gothic vengeance. Wein also tells the story in first person, from the perspective of the monster, except for one page in the middle in which Damian reflects upon his crime. We instinctively empathize with any character into whose shoes we are thrust, a trick well known to pulp noir writers. Wrightson in particular had good reason to appreciate the first-person narration. He had just ended a romantic relationship and felt rather like a lump of swamp who could only inspire revulsion in a woman. The bracelet was a nice fake-out. We see Linda give it to Alex early in the story and assume that she will be able to identify him by it at the end. But no, he’s lost it, just as he’s lost everything else. The knife twists, in a touch suggested by editor Joe Orlando. I had this issue early on. But I can't remember if I bought it off the racks, or picked up the back issue once Swamp Thing came out, which I did buy at the Drug Store. I had no idea it sold so well. According to Wikipedia, The Heap debuted in Dec '42 (Air Fighters #3), so predates Solomon Grundy. ^^ Yeah, I always understood that the Heap was where these shambling swamp monster characters originated. Great write up of that first issue, rberman. It was interesting to read and with some thought-provoking insights. I have a reprint of this issue in my collection and your review makes me want to dig it out and read it again. And Grundy looks more like a traditional strongman villain, even though they tried to have it both ways and say he was a walking swamp who just looked like an albino giant human. Whereas The Heap looked more grassy. Quick note on something that didn't make it into the write-up...Linda is based on Louise Jones (later Simonson) who modeled for Wrightson for this story. I'll have to dig out Twomorrows Swampmen books/magazine. And these issues. I haven't read them in eons. It began with Sturgeon, which prompted The Heap, which may have prompted Grundy (or from Sturgeon, directly). 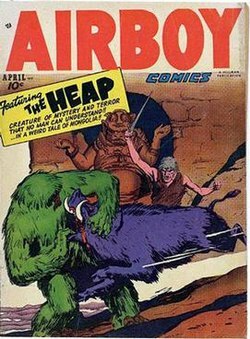 The Heap was a major part of Hillman and Airfighters was one of their bestselling comics. The Heap is Baron Eric Von Emmelman (inspired by German WW1 pilot Max Immelmann, no doubt), who is shot down and crashes over a Polish swamp, in 1918. He clings to life and his body mixes with the elements of the swamp, recreating him as The Heap. Originally, he battle Sky Wolf (a copy of Blackhawk); but, turns on the Germans and fights monsters and Nazis through the war. Skywald later came out with their own version and Eclipse gained the rights to Hillman's characters, including the Heap, as a supporting character, in their Airboy series (which is great reading, with stuff from Tim Truman, Chuck Dixon and Stan Woch). Anf "It" was adapted by Roy Thomas and Marie Severin, with a great Steranko cover. It began with Sturgeon, which prompted The Heap, which may have prompted Grundy (or from Sturgeon, directly). According to GCD, Grundy's first appearance was written by Alfred Bester and Julie Schwartz is listed as story editor. It's not hard to believe that one or both of them had read IT! It's impossible to believe they didn't. It began with Sturgeon, which prompted The Heap, which may have prompted Grundy (or from Sturgeon, directly). The Heap was a major part of Hillman and Airfighters was one of their bestselling comics. The Heap is Baron Eric Von Emmelman (inspired by German WW1 pilot Max Immelmann, no doubt), who is shot down and crashes over a Polish swamp, in 1918. He clings to life and his body mixes with the elements of the swamp, recreating him as The Heap. OK, that makes sense of a scene in Moore's run -- in The Parliament of Trees, I think? -- in which Holland-Swamp-Thing meets a bunch of previous Swamp Things, and one of them used to be a World War I fighter pilot. I will file that away for when we get to that issue... in a couple of months! This story is certainly quite similar to The Heap. It can't be a coincidence that Roy Thomas and Len Wein were simultaneously writing homages to The Heap in 1971. Surely they mentioned their work to each other at one of the many soirees they attended around that time. It's one of those great mysteries of the comic world. All parties deny knowing about the other book. And they are all know to be stand up gentlemen. Who knows what people say after they've tossed a few back... it could have been as simple as one saying to the other, "Hey, I was reading one of those old Heap comic books last week. Crazy fun stuff, right?" And then they both were inspired to go imitate it, unaware of what the other was doing. There appear to have been quite a few Kirby Colossi running around before Peter Rasputin came on the scene. The Story: Lieutenant Matt Cable drives married chemists Alec and Linda Holland to a secluded building in the Louisiana bayou so they can perform their botanical government research far from prying eyes. Unfortunately, it’s also far from law enforcement. One day two men in suits (the talky one is named Ferrett) and one enforcer show up, demanding an exclusive contact for the Holland’s work for Ferrett's employer The Conclave. Just as things are about to get ugly, Lt. Cable stops by for one of his periodic visits. Cable chides the Hollands for not protecting themselves better against the three sinister guests, but he doesn’t offer them a scintilla of additional security. Thanks a lot! Soon the three men are back, knocking Alec unconscious and planting a bomb in his lab. When it explodes and coats him with flaming chemicals, he runs into the swamp and disappears in a bog. Even after Alec’s funeral as Linda carries on the research alone, no additional security is provided, The three Conclave men lure Cable into the swamp, bash his head with a shovel, and then murder Linda. 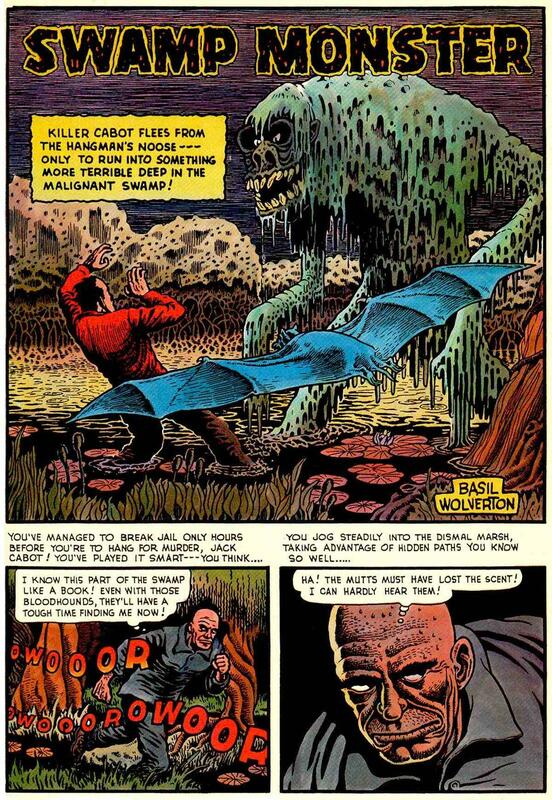 Alec rises from the muck as Swamp thing, chases down Ferrett’s car and kills him, with Lt. Cable as a sputtering witness who vows to catch Swamp Thing. Covers That Lie: Swamp Thing’s confrontation with Ferrett does not involve a female hostage. My Two Cents: It took DC Editorial over a year to convince Wein and Wrightson to revisit their hugely successful creation. Eventually they came up with a new spin which they didn’t feel would detract from the terse genius of their previous work. But I didn’t find this story to hang together as well this time around, as a "full-length novel." 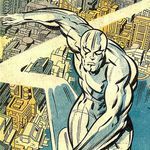 Its added elements also seems even more beholden to Man-Thing: The isolated, under-protected government laboratory; the strong-arm industrial espionage. But in Man-Thing’s tale, the lover was a traitor, whereas in Swamp Thing she’s the beloved wife, echoing the original tale of Linda Olson. The expansion introduces new stock characters including a sinister corporation and a dogged Javert-like government agent who mistakenly blames the creature for murdering the scientist (see also General “Thunderbolt” Ross, nemesis of The Hulk). Just what did Cable think Swamp thing did here anway, besides kill the likely culprit in the murders of Alex (dead by fire) and Linda (dead by gunshot)? Did he think Swamp Thing was the one who bashed his occiput with a shovel? (How did Cable know he was hit with a shovel?) Why did he not suspect foul play on the part of the bad guys whom Alec warned him about, the same bad guys Swamp Thing was fighting? Nor is there any dialogue beyond “I should have been there” to explain why Linda wasn’t killed in the explosion with Alec, or why Ferrett didn’t try to kidnap either scientist rather than murder them serially. Still, the story accomplishes its main goal of sending Alec, flaming and screaming, into the marsh so that he can be reborn as a floral angel of vengeance, not so far in concept from The Spectre or Ghost Rider, despite the differences in set dressing. The research lab is said to be a “resurrected stable,” but although it looks like a barn on the outside, the inside has a laboratory on the first floor and a full library ringing the wall on a balcony level above. The leader of The Conclave appears to have a pet werewolf. OK, that’s creepy! Plus he lives in a shadowed mansion festooned with serpentine candlesticks from which spent candles have not been cleaned. Wrightson is doing his best to keep the gothic vibe going despite the modern setting of this story. There's also a running plot that the Conclave have sent a stray dog, equipped with secret GPS locator and cameras, into the arms of the good guys.